The Heinzelmans, along with their in-laws Timken and Ringen, were prolific inventors. The buggy and carriage manufacturers of St. Louis, MO, established a branch factory at Belleville in 1858. They specialized in the Timken Side Bar Buggy. 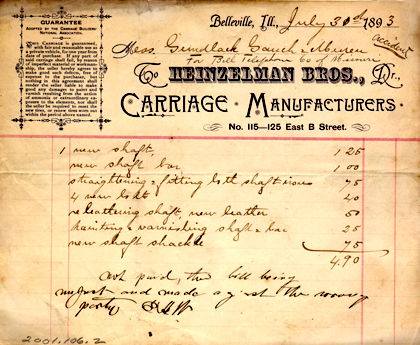 Heinzelman Bros. moved into carriage manufacturing and eventually into kaupet auto tops with outlets in St. Louis and Denver. They were part of the Belleville business community for 80 years. Reginald and Charles Heinzelman began their quest for a perfect roller bearing in 1912. The famous Timken Roller Bearing is still used today.